Case studies are a great way of using storytelling to promote your business. 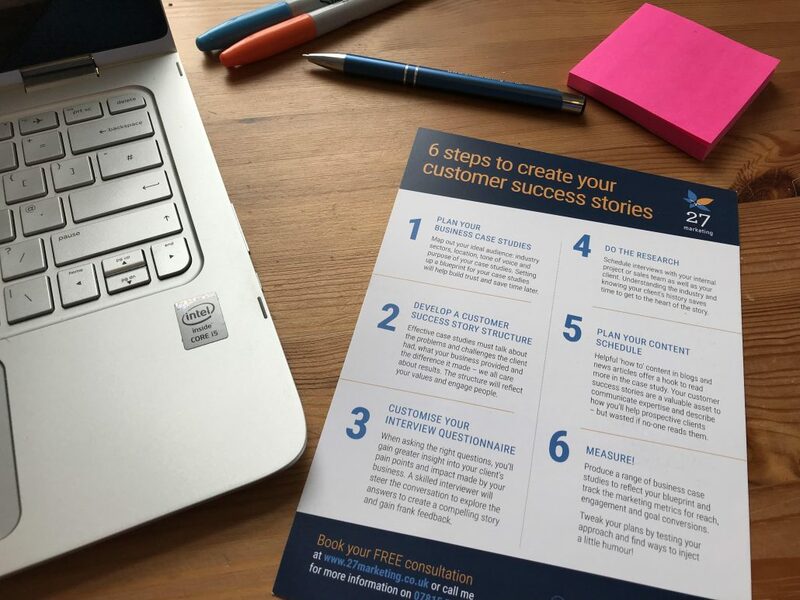 They offer the classic story format of starting with a person facing a challenge or desirable goals, a middle plot to share what happened next and ending with the results you delivered for the customer. A well-researched case study goes a step further than a standard testimonial by revealing your unique approach in enough detail to prompt the reader into action. The full story will resonate with people struggling with similar challenges because it shows how well you understand the pains and where you can help others. Select the ‘best’ customers to feature in your case studies. This means identifying those who fit well with your brand values and sit in markets where you already sell or want to sell in future. When shared on popular platforms, a relevant case study will increase your brand awareness, credibility and authority. Only choose the stories where you can demonstrate measurable change because we, as readers, all care about results. Review it afresh: who are your ideal audience? What do you know about the specific people you’d like to help and therefore, have to sell to? It’s no good guessing what your average customer looks like. Whoever they are, it matters whether the problem you’re covering in the story is well-defined enough, so that those people recognise themselves and relate to it. Book time in to talk to the person in your organisation that knows the client best. Spend time discovering more about the customer as a person and research the company they work for. Having a clear understanding of the relationship history and the industry will save you time. When you’re ready to talk to the customer for their testimonial, you can get straight to the heart of the story. Many businesses write their case studies without talking to the customer. I always recommend interviewing them, to seek the truth behind the service delivered. I find it saves time for getting the story approved for sharing it publicly. Be open and honest about how the case study will be used and what you hope the results will be. Being more transparent helps the customer feel more comfortable, which in turn gets you detailed and honest answers. Effective interviewing comes with practice, but an easy first step is to plan and adapt your questions. Plan beforehand based on the information you want to get, but be prepared to adapt it on the call to gain deeper insight. I design a custom questionnaire for each of my case study clients, to make sure the practical results and emotional impact are covered. Using prompts to explore the interviewee’s answers will get more honest feedback to create a compelling story. What differences have you seen since buying this service? How is the product or service helping you save time? What £ costs or revenue impact has there been from using this service? How does it enhance your competitive advantage? A final note: before you define what makes a great case study for your business, it’s critical to consider, what are you trying to achieve? Case studies can certainly help you sell, but if your challenge is gaining greater brand awareness, you could choose a different range of case studies to feature – and make them wider-reaching instead of detailed stories. Identifying a baseline before you start helps you track the effectiveness and marketing metrics of each case study you share – to see how many people engage with it and goal conversions. Then you can see what’s working well and what isn’t. Use this data to tweak your plans; move on by testing different approaches or find ways to inject a little humour! Contact me if you’d like more help to plan the right case studies for your business. Creating content to reach your audience – 3 reasons why consistency m... Customer testimonials: Are you boring your audience with boastful quotes?